I recently took my kids to the zoo for the very first time. They’ve seen animals at a local ranch but it pales in comparison to the exhibits at the zoo. There are two different geographical sections that feature animals indigenous to either area, and residents range from the basic brown bear in a tree-filled enclosure to the exotic red lemur who rested on a rock surrounded by water. I tried to explain why each animal was in a different enclosure instead of living together like at the ranch, and the concept of geography was lost on both myself and my kids. Clara Animals does a stellar job of explaining that concept so kiddos can really wrap their heads around it. The app lets players choose one of three characters to visit one of three regions. Once the character is dressed accordingly they are transported to either the farm, an African desert, or the ocean. Within each “world” pictures of animals are tapped and mini-games show how each creature eats, lives, and interacts as part of a family unit. One element that we look for when deciding whether an app is an All Star is ease of use for the targeted age range. 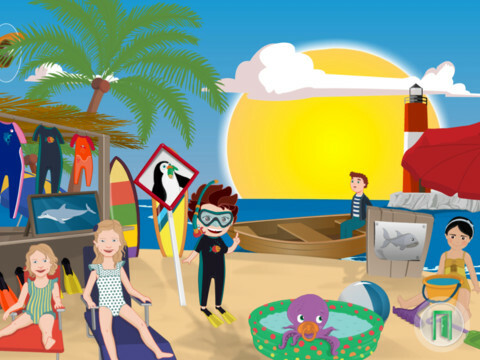 Clara animals has no written instructions or even verbal narration, only animations to show how to get started. This intuitive game play continues into the individual regions and the mini-games; progression in the app only requires a simple tap, and it doesn’t have to be on a certain point on the screen. 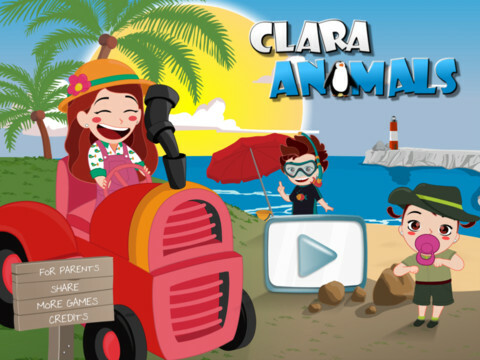 The App Store description of Clara Animals claims that the app will keep players busy for up to 60 continuous minutes. While we didn’t play quite that long, it’s easy to see how kiddos could stay engaged for almost an hour. Considering the price point of $1.99, this app has all of the makings of an All Star!